Floyd Mayweather Jr.’s auxiliary goal in the sport of boxing, for over four years now, seems to have been to tear down the image of Manny Pacquiao in any way he can. Floyd can’t and/or won’t do it in the ring so he does it outside of the ring with racial and ethnic slurs, mocking insults, false and damaging accusations, and various other attempted belittlements. A mission of sorts, clearly Manny has been on Floyd’s mind more than Floyd has been on his. Floyd likely hoped Manny was done, once and for all, after Marquez knocked him out last year, likely betting that he would never have to face him in the ring or to compete with him again in any venue or on any level. But Manny came back in impressive style and now, Floyd can’t handle it. He thought Marquez had put out Pacquiao’s lights permanently. Instead, they are shining again, and even if not as brightly as before, there remains a strong glimmer of hope and confidence for, and in the man. Floyd Mayweather Jr. simply cannot handle this truth. Here’s a question: If Manny is so insignificant, if he’s so much lesser than Floyd, if he’s not on Floyd’s level, if Floyd won’t fight him until he leaves Bob Arum, why is Floyd wasting so much brain and vocal energy on Manny Pacquiao? Among the answers to that question might be envy, jealousy, contempt, and hate. These appear to be the emotions and thoughts that Floyd Mayweather Jr. has for Manny Pacquiao. Floyd has demonstrated these traits over and over and over through the years, from PED use accusations, to cell phone video rants, to calling the man a “midget” and “yellow” (referring to his race, not his courage), and recently, he published an insulting “Christmas Card” and artwork of him supposedly smashing Manny Pacquiao in the ring. The man works so visibly hard to demonstrate his hate for Manny Pacquiao. But why? Perhaps Floyd Mayweather Jr. is obsessed with Manny Pacquiao and he cannot cope with Pacquiao’s greatness. This is not to say Pac would beat him if they fought—or vice-a-versa. But there is something about Manny Pacquiao that Floyd just cannot let go of. Maybe it’s because where Floyd Mayweather Jr. is well-known, Manny Pacquiao is an international hero. Maybe it’s because where Floyd Mayweather Jr. is the highest paid athlete in professional sports, Manny Pacquiao has more followers and fans than any other single athlete in the world. Maybe it’s because while Floyd Mayweather Jr. burns one hundred dollar bills and boasts about all his white luxury cars, Manny Pacquiao is recognized as a savior to his Filipino brothers and sisters. 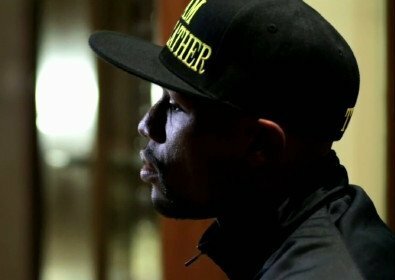 Mayweather has demonstrated a foolishly abusive nature that has been checked only once by a short jail term. Well, actually it’s been checked twice, at least: Once by the jail term, and a second time by the out-of-court monetary settlement (a hefty one, no doubt) and written settlement agreement he had to give Manny Pacquiao for levying unsubstantiated PED-use accusations against him (You can smell the hate brewed from that). Yet, the foolish streak in Floyd Mayweather Jr. is as big as his ability to earn money, to be a super star, and to become a celebrity. The black spot of foolishness is more evident in Floyd Mayweather Jr. than the yellow streak that runs down the back of a coward. Alas for Floyd, Manny Pacquiao has proven to himself to be a champion not only in the ring, but in heart, mind, and disposition as well. This is a type of champion that Mayweather has no idea of how to confront, much less to defeat. While Floyd relies on narcissistic bragging, insults, racial and ethnic attacks, and other low-handed efforts in an attempt to bring Pacquiao down while bolstering himself up at the same time, Manny counters with silence, humility, a smile, and peace. He gives Floyd no fuel for the shameful fire that burns within him and which Floyd cannot extinguish, because Floyd is his worst enemy in spite of himself. Floyd Mayweather acts like a big man on the outside, but on the inside it appears that he is very, very small. 50 years from now their portraits, dedication, and history will be on display in the Boxing Hall of Fame. 50 years from now Floyd Mayweather Jr. will still be remembered for his amazing boxing skills, his wealth, his business acumen, and quite possibly, as the greatest boxer to ever grace the sport. In comparison, Manny Pacquiao will also be remembered as a fine boxer and warrior and like Mayweather, as one of the greatest boxers of all time. But he will also be remembered as a humble warrior with an undefeatable spirit, as a humanitarian, a savior, a man for the people, and as a leader. If Floyd is lucky, his portrait, memorabilia and written history will be placed right next to that of Manny Pacquiao in the Boxing Hall of Fame. This will ensure that the biggest thorn in Mayweather’s side will be there to haunt him for as long as the Boxing Hall of Fame exists. And if there truly is an afterlife in which spirits have the power of voice and action, Floyd can continue to rant about Manny Pacquiao for all eternity. That should make his soul feel good. But who would listen? Or care?